Tyrol (German: Tirol) is a province (Bundesland) in the mountainous west of Austria. Historically and culturally, Tyrol is a region that includes parts of Northern Italy with a Tyrolean population (Südtirol). Tyrol has a population of approximatley 692,000. 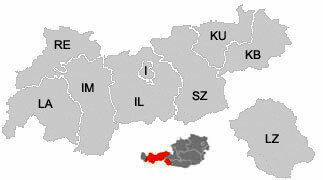 Tyrol is divided into nine districts (Bezirke): Imst (IM), Innsbruck (I), Innsbruck-Land (IL), Kitzbühel (KB), Kufstein (KU), Landeck (LA), Lienz (LZ), Reutte (RE) and Schwaz (SZ). In these, there are 279 muncipalities, of which 11 are cities (Stadt) and 19 towns (Marktgemeinde).